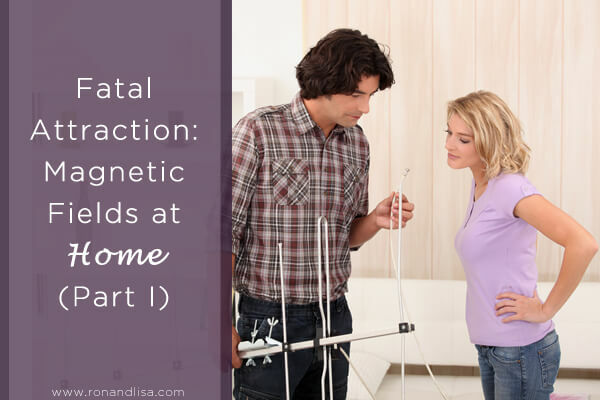 The type of electromagnetic field (EMF) best known to most people is a magnetic field from electricity; yet there is still much to learn about where this EMF originates, how it affects your family and what can be done about it. We will cover this topic over a three part series beginning here (Part I) with some important basics about EMF’s. The magnetic fields we are focused on are caused by electricity and hence are called, electro-magnetic fields. This distinguishes them from much weaker magnetic fields generated by the earth, called geo-magnetic fields. Electricity generates both electric fields and magnetic fields. These fields are at right angles to each other and they both fluctuate in strength or intensity in a sine wave fashion. Each sine wave includes a positive half and a negative half. One cycle per second is called one Hertz (Hz); named after Heinrich Hertz who discovered this phenomenon in the 1800’s. Many different sources and devices produce electric and magnetic fields all along the frequency spectrum – from brain waves at the low end – to house wiring, radio waves, heat, light and UV up to the fastest EMF’s (X-rays, gamma rays and cosmic rays) at the high end. All possess electric and magnetic field components, while EMF’s at different frequencies result in varied effects on health. It is important to know that electric and magnetic fields act as distinct, separate entities at the frequency at which electricity oscillates in house wiring; 60 Hz. Hence, electric fields are measured separately from magnetic fields utilizing different meters and instruments. These differences in these fields explain the varying effects physiologically. We already covered electric fields – which primarily affect the depth of your sleep – in two previous articles: Electric Fields, Melatonin and a Deep Night’s Sleep: What’s the Connection? and Finally, a Good Night’s Sleep and a Healthier Home! We will introduce each type below and then discuss mitigation techniques in a future post. 1.) Magnetic fields from outside power lines exist because of separation of wires on poles. They can also occur because of differences in current loads on the wires due to electricity simultaneously flowing on parallel paths (including metal city water mains and cable lines at the street). Magnetic fields from power lines are the most troublesome, because there is no effective shield against them. They can extend over half a city block, encompassing every house in their path. During a home survey, when I measure virtually the same magnetic field level with my Gaussmeter regardless of where I walk, I will look outside for the power line. The field level will vary only slightly from the back of the house to the front, and will continue to increase as I walk out the front door and approach the power lines at the street. 2.) Magnetic fields from point sources. These include transformers and motors. They are present in every house. The good news is the field strength drops off quite quickly within a foot or two of distance (stay tuned for more on this in Part II). 3.) Magnetic fields from incorrect wiring, which a surprising number of homes contain. As long as the current load on the “hot” and “neutral” conductors of each circuit is the same, the magnetic flux fields they create will always cancel each other out. This is our goal; this is code; and this is what is expected of electricians – yet too many electricians make sloppy mistakes and don’t realize the consequences. Current loads are no longer equal, and large and unhealthy magnetic fields result. Besides being code violations, wiring errors are also fire hazards. Fortunately, we can find and correct these (as we will discuss in Part II). 4.) Magnetic fields from electric current on grounding paths – such as metallic water pipes and cable lines – exist directly under your floor, up a wall, or across a ceiling. These cause magnetic fields in your living space night and day, even with your power off. There are relatively simple, code-compliant ways to mitigate these parallel paths (which are themselves code violations). Magnetic fields are more prevalent than homeowners realize. They need to be detected and removed to prevent possible negative health effects and disease. We will address how to measure them, how they affect your health, and how to mitigate them in the follow up posts.